Happy Monday friends! I was so excited about this week's Inspiration Monday choice. I knew I had the perfect outfit, plus we just started watching Modern Family, so I adore Sofia Vergara right now. Plus, I still can't get enough orange, so this was perfect. And I don't want to toot my own horn too much or anything, but I feel like I nailed this one pretty well. I decided to try out this fun purse I got at the Cliche sale, because yes, I still have a purse addiction problem. Anyway, it's a nice fun summer purse, but the problem is, it's not going to be suited to everyday use. I don't think I carry all that much in my bag, as I shared back a few weeks ago, but apparently I have enough that it doesn't quite all fit in this little guy. So I think he'll be downgraded to a "going out only" type purse. Oh well, at least it was cheap! We had a pretty full weekend. We got a ton of errands run, we did a church service with our music group and we celebrated my sister-in-law's birthday. And somewhere in there we managed to have a lunch out just for Mr. Monkey and myself and we sat outside since the heatwave FINALLY broke. Sitting outside on a nice day drinking beer with my Pants Monkey is my favorite. We also went shopping to get the Pants Monkey some new clothes. I'm very proud of him, he's been controlling his diet for a few months and has dropped about 25 pounds. So, he needed some shirts to fit as well as a new belt. Since we had to get a present for his sister anyway, we picked up a few things for him. He's looking quite dapper if I do say so myself! I'll have to get another picture of him to share. And that's about it. After what was probably one of our busiest stretches of summer we have a couple of weeks of calmer days and I'm planning to enjoy them. I just hope the extreme heat stays away, but that isn't sounding terribly likely. So it goes! Please head over to the two birds blog to check out more Inspiration Monday looks. I love the color of your top & that purse is super cute! Yeah, I am SO glad that the heatwave died off. I can handle 80-85, but 104+ is horrid. You look fabulous in orange - great work on the inspiration! Glad to hear the heat wave has broken! isn't this "new" weather perfect? it sounds like you had a fabulous weekend! yay! i love you in orange! You did such a great job recreating the look, Beth! Your bag is really cute with the chain and studs detail :) Too bad it doesn't fit that much stuff though! Great job, Beth! And good job, Pants Monkey! 25 pounds is great! I am envious that your heatwave broke over the weekend! Ours just did today, so I spent the weekend sweating! hahaha. LOVE you in orange, Beth! Fabulous colour of orange. I like the empire waist too. I'm totally ALL OVER this purse! It's sooooo cute with the straw and black and snazzy gold details. It's really a gem :) I'm going shopping for my man this week too...got a special offer from Old Navy for 40% off everything I buy on Wed.
You've definitely got that style matched! I'm loving that necklace of yours. Looks like a great staple piece! Oooh, this top looks nice on you! Such a nice colour and so much nicer than the inspiration outfit top!! That is a good color for you! You're right. You nailed it. Totally nailed it! You look wonderful and congrats to your hubby! You did nail it in a big way, you look fabulous. Ooh you did nail this one! I love that orange top on you! I hope you get some relaxation in. This is a fabulous color on you. I also love your bag. Congrats on both the Pants Monkey's weight loss and on the heatwave break! Jealous of your weather. We've had two flash storms that have just ended in misty-humidity, the ground is pretty much just steaming dry. 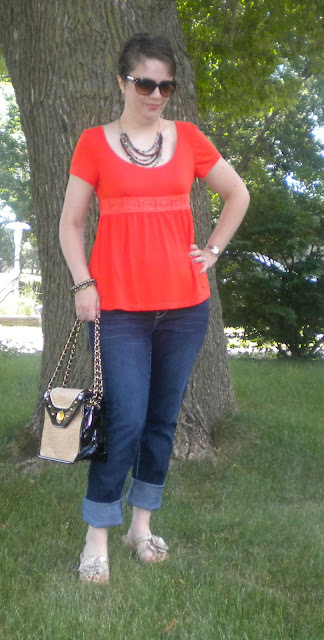 Very very pretty Beth, I love the colour orange on you and that purse is adorable! My man changed his diet and has been shedding the pounds as well- it's so exciting! Whew hope it's not so hot in MN when I come down at end of July! You look fab! I really love that color orange and I love your bag! Congrats to your hubby for loosing 25 lbs! 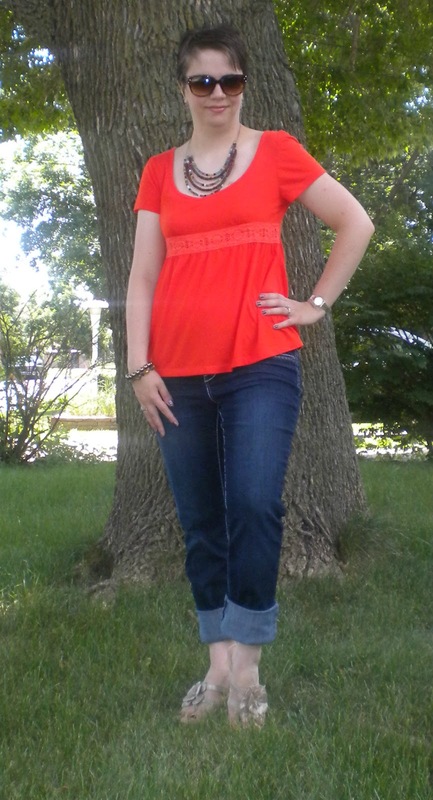 You look gteat Bethie i like the coral top on you...you definitely nailed this fabulous summer look! Congrats to your hubby for successfully losing some pounds! !